Last week, Argentinian Cardinal Jorge Mario Bergoglio became Pope Francis I, the first non-European Pope in over 1,200 years, and the first from Latin America. As the first Pope from the region that currently includes a plurality of the world’s Catholic population, Francis’ election signals the importance of Latin America to the Church. Francis’ election may also help rekindle Catholicism among those in the U.S. with roots in Latin America: the Hispanic population. Hispanics in the U.S. are becoming a major demographic force within the American Catholic Church. In two decades the percentage of American Catholics of Hispanic descent has more than doubled; today nearly 3-in-10 (29%) American Catholics are Hispanic. 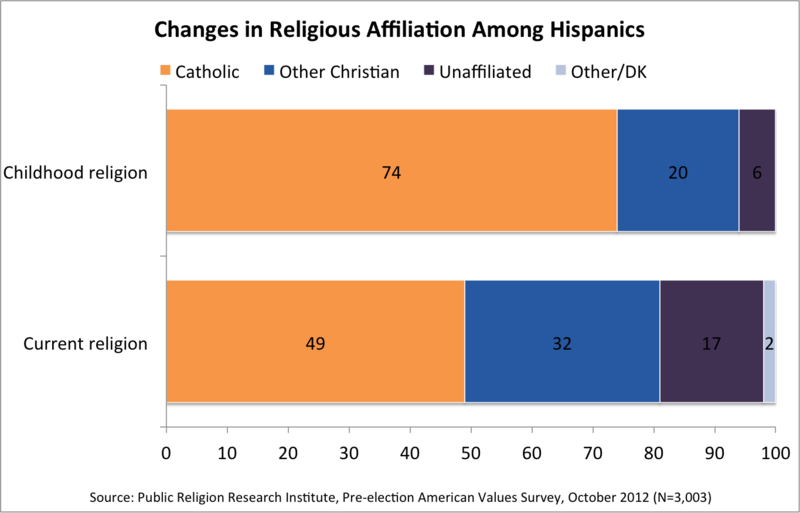 The U.S. Catholic Church has been reinvigorated by the growth of the Hispanic population. In fact, one of the primary reasons why the overall Catholic population has not witnessed they same type of precipitous decline experienced by the mainline denominations is because of immigration and natural population growth. In 1990, nearly 8-in-10 Catholics were non-Hispanic whites. Currently whites make up 63% of the U.S. Catholic population. Nearly half (48%) of Catholics under the age of 30 are now Hispanic. However, there are signs of decline among Hispanic Catholics. Nearly half (49%) Hispanics currently identify as Catholic while nearly three-quarters (74%) reported being raised as Catholic. This decline stems from two very different patterns of conversion. Nearly one-third of Hispanics (32%) now identifies as Protestant, a significant increase over the 1-in-5 who report being raised in a Protestant tradition. The ranks of the religiously unaffiliated have nearly tripled among Hispanics primarily the result of conversions away from the Catholic Church. Yet there are reasons for optimism in the Church since the new Pope seems ideally suited to appeal to Hispanic Catholics. Pope Francis reportedly is a traditionalist who also champions the issues of poverty and social justice. Hispanic Catholics are significantly more likely than white Catholics (48% vs. 40%) to believe the Church should preserve its traditional beliefs and practices and a majority of Hispanic Catholics (52%) believe that in its statements about public policy the Church should focus more on social justice and the obligation to help the poor. The Catholic Church is also facing similar challenges in Latin America, where conversions away from Catholicism, either into other Christian traditions or no-religion, are becoming commonplace in Brazil and Mexico, the world’s largest Catholic countries. Maybe a Pope from the region where the preferential option for the poor was born will halt these defections and move the Church in a direction more in sync with the preferences of Latin American Catholics. If this is the case, we can expect the effects to spill over to Hispanic Catholics in the U.S.